Since antiquity, knowledge and understanding of the anatomy and functions of the human eye has attracted a great deal of interest. In 200 A.D., Galen devoted an entire book to the eye, while Leonardo da Vinci, during the Renaissance, produced some spectacular schemes and drawings on the subject. In 1604, Johannes Kepler, following the theories of the Islamic physician Alzahen, offered the first theory of the retinal image. Both form and function of the eye are explored in this exhibition, which showcases two three-dimensional models preserved in the University Museums and Collections. These have been used in this institution to teach the anatomy of the eye since the late nineteenth-early twentieth century. 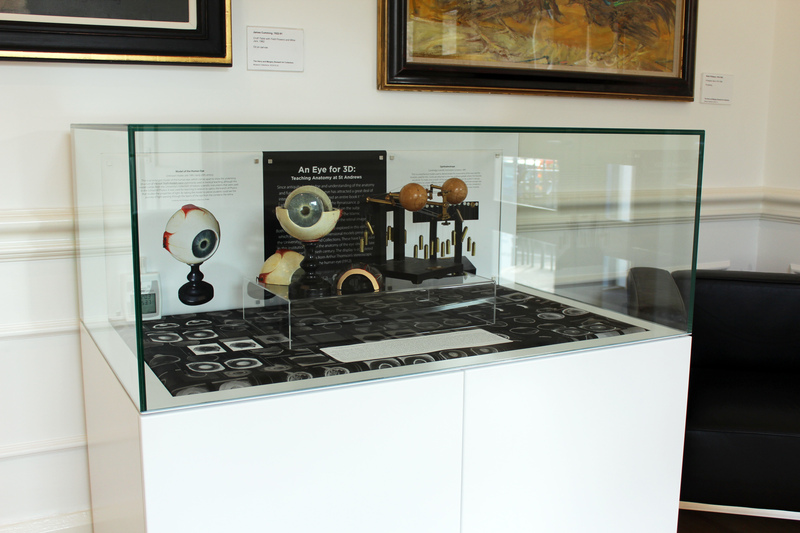 The display is completed by some reproductions from Arthur Thomson’s stereoscopic images of the human eye (1912). The display in the foyer of the School of Art History, University of St Andrews. This is an enlarged model of the human eye, which comes apart to show the underlying structure of the eye. 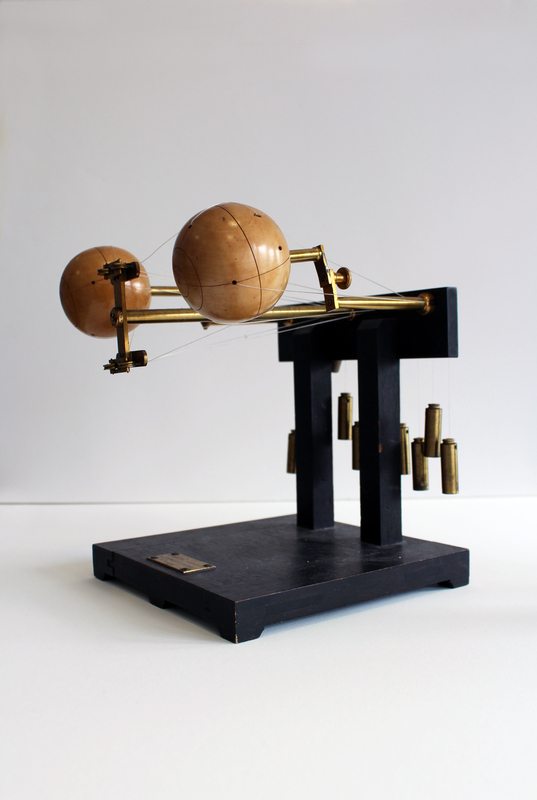 Such models were commonly used in medical teaching, although this model comes from the University’s collection of historic scientific instruments that were used in the School of Physics. It was used for teaching in relation to optics, the branch of Physics that studies the properties of light. By taking the model to pieces students could see the journey of light passing through the layers of the eye from the cornea to the retina. 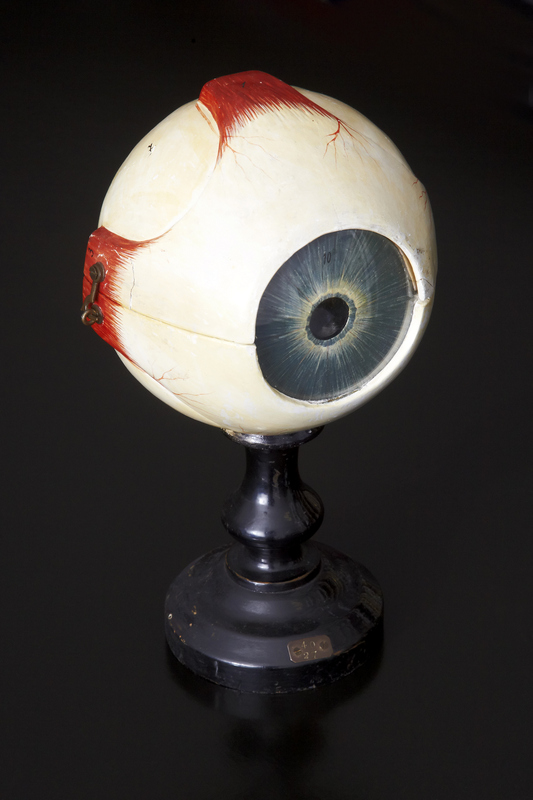 Unknown maker, late 19th/early 20th century, Model of the Human Eye. University of St Andrews Museum Collections, PH982. This is a mechanical model used to demonstrate the movements of the eyes and the muscles used for this. Cords are attached to the two artificial eyeballs where the muscles would be. To make one or both of the eyes rotate the cords can be pulled in various combinations to create different directions of movement. 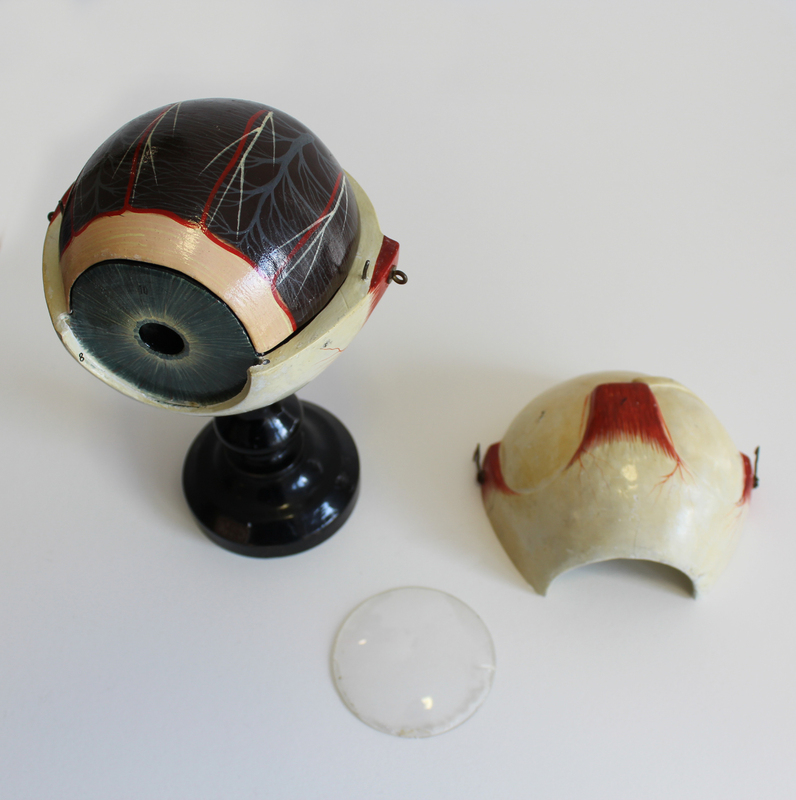 The first Ophthalmotrope was made by Theodor Reute in 1845, this one is from 1889 and comes from the University’s medical collections. It was used to teach students about the complex eye muscles. 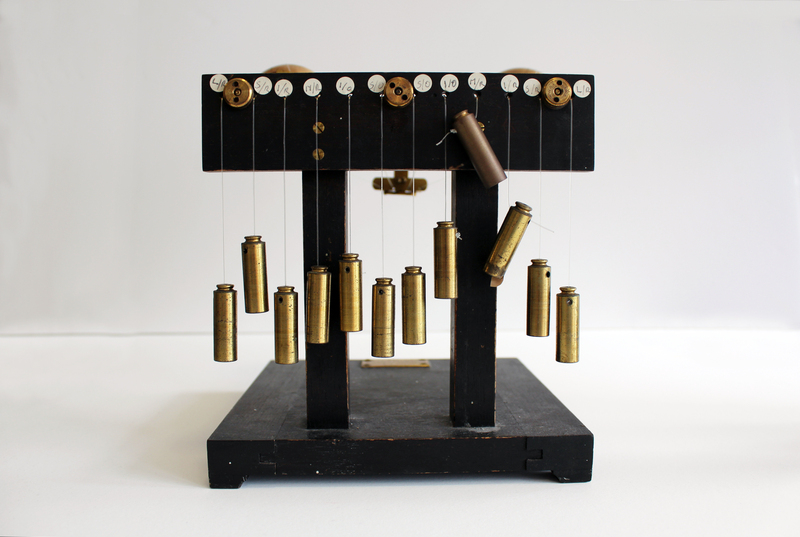 Cambridge Scientific Instrument Company, 1889, Ophthalmotrope. University of St Andrews Museum Collections, AP1275. 3. 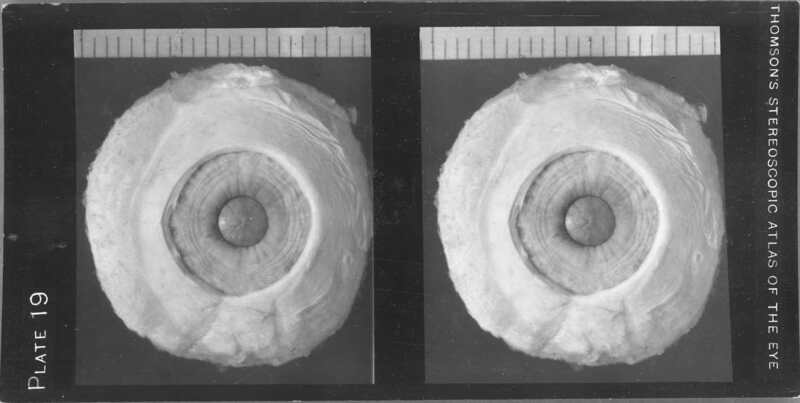 “The anatomy of the human eye, as illustrated by enlarged stereoscopic photographs”. Born in Edinburgh, Arthur Thomson (1858-1935) arrived at the University of Oxford in 1885 to take up his post as Lecturer in Human Anatomy, becoming Professor there in 1893. In 1912 he published a work which combined photography, anatomy and drawing: The Anatomy of the Human Eye. The edition included 67 loose stereographic photographs. They are gelatin silver prints, from a portfolio (29 cm) – which can be seen here reproduced – under the title: “Thomson’s stereoscopic atlas of the eye”. He decided to illustrate his account with stereoscopic views, since he knew that this format had been appreciated by his students. The choice of stereoscopy was dictated by the subject: “Many of the structures in the human eye”, he wrote in the introduction to the first edition, “are so small that it is only possible, under ordinary circumstances, to obtain a satisfactory view of them by means of a lens of low power. This usually involves their examination by monocular vision, and consequently entails a loss of that stereoscopic effect which is so necessary to determine their exact relations. With the object of overcoming this defect, the present illustrations were prepared in such a way as to preserve the stereoscopic effect, and at the same time to provide for such a magniﬁcation as would render clear most of the detail desired”. The St Andrews copy was donated to the University by A. Maitland Ramsay, Esq., M.D., C.M., LL.D., F.R.S.E. in June 1941, and has been used by students and staff here since then. The anatomy of the human eye, as illustrated by enlarged stereoscopic photographs by Arthur Thomson, M.A., M.B., F.R.C.S., professor of human anatomy in the University of Oxford. Oxford: Clarendon Press, 1912. Plate 1. University of St Andrews Library, Special Collections, Photo QM511.T5. The anatomy of the human eye, as illustrated by enlarged stereoscopic photographs by Arthur Thomson, M.A., M.B., F.R.C.S., professor of human anatomy in the University of Oxford. Oxford: Clarendon Press, 1912. Plate 19. University of St Andrews Library, Special Collections, Photo QM511.T5. The anatomy of the human eye, as illustrated by enlarged stereoscopic photographs by Arthur Thomson, M.A., M.B., F.R.C.S., professor of human anatomy in the University of Oxford. Oxford: Clarendon Press, 1912. Plate 67. University of St Andrews Library, Special Collections, Photo QM511.T5. The exhibition forms part of the St Andrews Photography Festival - link to webpage here - and is supported by Thinking 3D. The curator wishes to thank Jessica Burdge (Museums & Collections), Rachel Nordstrom and Edward Martin (Library, Special Collections), Leo Mewse (Print & Design), and Andrew Demetrius (School of Art History) for their work.